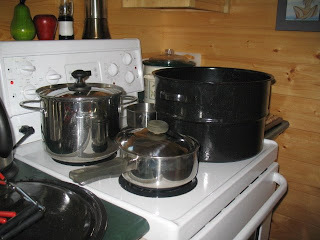 Until we moved to BC, I had never preserved food or 'canned' in my life. It wasn't something my parents did, or anyone else I knew for that matter. Growing up in a suburban neighbourhood, we didn't have a vegetable garden, although my Dad was a fantastic gardener, his preference was for flowers with roses being his favourite. When we moved to the Okanagan we experimented with jam during strawberry and raspberry seasons, and really enjoyed the results. 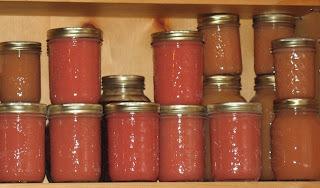 Last week-end, I had the pleasure of getting in on some canning Erich's aunt was doing. She is an extraordinary person. Her and her husband moved 'back to the land' in the 70's and raised their three sons without electricity, indoor plumbing (except for running water) and in the early days, access was by lake only. Erich's mom has a great story of being with Susan when they got a dairy cow as a wedding present, and bringing the cow across the lake on a raft. Erich remembers her being the best baker he knew, cooking on a woodstove and being able to adjust or keep constant the temperature based on the amount of wood being burned. My favourite story, was Susan's description of washing cloth diapers in the cold Cariboo winters, by cutting a whole in the ice of the lake and hauling water to wash the diapers in. So, as you can imagine, when she said I could come and learn how to make and can crab apple sauce, I jumped at the chance. Thus far, Erich has been the canning expert, so I decided it was time for me to learn the process. So we started by heading out and picking some crab apples. The only crab apples I had seen were ornamental, so I had thought they weren't even edible. I was surprised to take a bite and discover how tasty they were. Susan quickly filled two buckets, I picked some nice red ones up on the ladder ( this is the secret to the pink colour of the finished product). Jill, Susan's daughter-in-law, was even quicker with her method of stripping branches like a bear, she was able to fill three baskets in half the time! 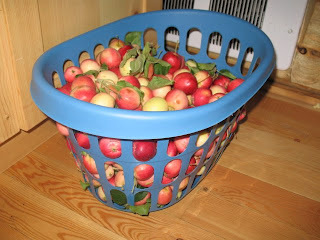 The first batch came out more peach coloured, as the apples were from lower down in the tree, the second batch were picked high up in the tree and had really red skins. Yum! 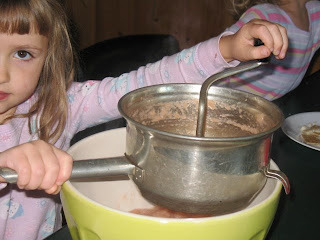 It tastes really good and the girls love it! Hopefully next year we will have a greater bounty from our own garden to put up for the winter. Someday perhaps I too will have a 'cupboard under the stairs' like my friend Heather. Oh, that is too weird seeing my "cupboard" on someone's blog. You should see how messy it is right now. The floor is filled with empty jars waiting to be filled as well as other assorted mess. The shelves are filling up though so that is what really matters. :-) I just caught up on 30 lbs of ripe tomatoes from my garden this morn and then S brought home 70 lbs more from a friend when he went to pick up the dog. Your preserves look gorgeous. 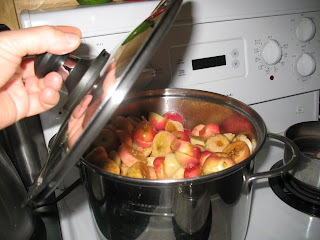 My husband loves crabapples - maybe your post will inspire him to get some and make some butter or jelly. I love the beautiful colour of it too - and it will seem even more lovely come winter. 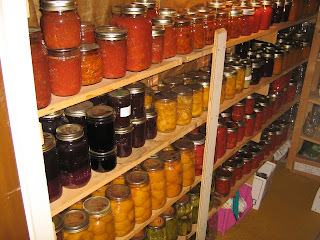 Perhaps you have caught the preserving bug? Can't wait to see your shelves fill up too. We are just back from your neck of the woods. I loved it, especially Green Lake. Found a couple fun thrift stores too. Do you know the log cabin one at Lac La Hache or the S.M.A.C at Seventy Mile?